On October 11, 2018, Livent Corporation started trading on the NYSE under the ticker LTHM following its IPO. The company issued 143 million shares and the stock opened at $16.25, determining a Market Capitalization of $2.3 billion. Livent Corporation is a spin-off of the diversified chemical company FMC, which will receive all the proceeds of the IPO and retain control of about 86% of Livent Corp’s shares. But what is a carve-out? How does it relate to Livent Corp’s IPO? In order to better understand the rationale behind this IPO, we will briefly introduce what a carve-out is and what might be the reasons for its implementation. A carve-out is the partial divestiture of a business that consists in separating a subsidiary or a business unit from its parent as a standalone company. A company undertaking a carve-out is not selling a business unit but, instead, is selling an equity stake in that business or spinning the business off on its own, retaining a controlling interest in the new company. Equity carve-out, when a business sells the stock of a subsidiary to the public market for cash. This is the case when company does not believe that a single buyer for the entire business is available or the parent wants to maintain control over the business unit. Spin-off strategy, when a company divests a business unit by making that unit its own standalone company. However, rather than selling shares publicly, current investors are given shares in the new company. In this way after the spin-off has gone through there is no relationship between the two companies, even though both are owned by the same shareholders (see Figure 1). In practice, a corporation creates a spinoff by distributing 100% of its ownership interest in that business unit as a stock dividend to existing shareholders or offer them a discount to exchange their shares in the parent company for shares of the spinoff. ​The rationale behind this strategy is that spin-offs tend to increase returns for shareholders since the newly independent companies can better focus on their specific products or services. Both the parent and the spinoff tend to perform better as a result of the spinoff transaction. ​It is easy now to understand how Livent’s IPO classifies as a spinoff. 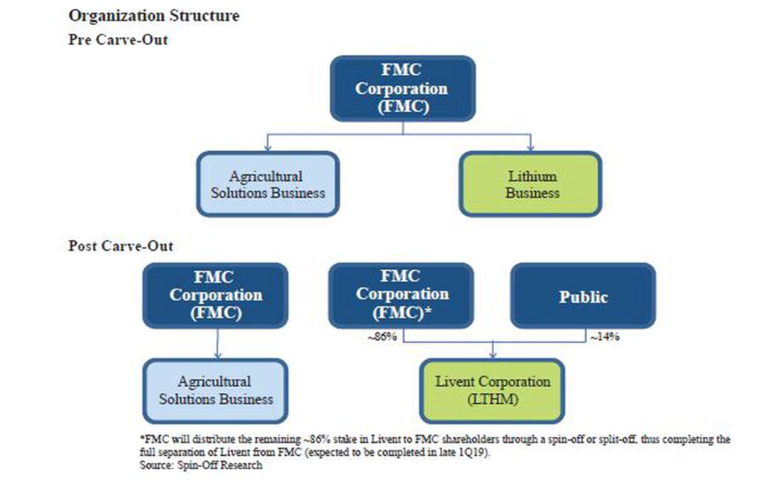 As a matter of fact, post spin-off the parent company FMC still owns 86% of Livent, shares that will then be distributed to its shareholders, thus completing the full separation of the two. Following the spin-off FMC will become a pure-play agricultural company focused primarily on pesticides. On the other side, Livent Corporation will be a pure-play, fully integrated lithium company, involved in producing performance lithium compounds. The new organization structure is shown in Figure 2. The separation of the Lithium business will enable Livent Corporation (earlier FMC Lithium) to focus on capacity expansion to meet the rapid pace of global lithium demand growth. As a matter of fact, Livent Corp’s primary products are battery-grade lithium hydroxide and high purity lithium metal which are critical inputs used in various performance applications. Livent Corp’s focus will be on supplying high performance lithium compounds to the fast-growing Electric Vehicle battery market (Roskill Consulting Group reports that demand for battery-grade lithium hydroxide for use in EV applications is expected to grow at a CAGR of 44% through 2027). For example, Lithium hydroxide is the form of lithium used in batteries made by Panasonic for Tesla vehicles. Moreover, Electric Vehicles batteries are expected to represent 64% of the total consumption of lithium compounds through 2027, driven by the growing penetration of electric vehicles. Finally, with the separation, Livent Corporation will have “emerging growth company” status, implying the company’s eligibility for certain exemptions from federal securities laws. The deal also makes sense considering that LTHM accounted for just 10% of the consolidated company’s revenues, while the management was investing a disproportionate amount of time, given the unit’s robust growth prospects. In addition to that volatile lithium prices represented a considerable risk for FMC.